I am certainly no authority on Queen records (though I do have a blue Bo Rhap from the limited edition of 200 - No 195 - courtesy of Fred) but items connected directly to touring, such as itineraries, jackets, T shirts, passes etc, I have a very good memory for. Avoiding fake Queen items; I would always suggest that you always ask for provenance from the seller. Who are they? How did they get it - and from who? If an item is from the 1970s or '80s it's realtively old, and should smell, look and feel old. If something is offered for sale with a COA (Certificate of authenticity) beware! Provenance is what is needed - not something that can be printed out randomly on a computer. If the item is rare and/or expensive then by all means ask for a letter from the seller listing provenance. EG: A fake NATO pass - no laminated passes were ever issued for this tour. 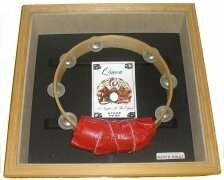 Tambourine from 1975 UK NATO tour. I used some odd roll of red gaffa tape to secure the foam pad to protect Fred's leg. 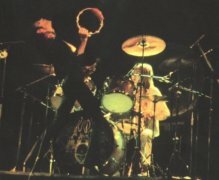 After that tour black gaffa was always used on Fred's stage tambourines. This is probably the only tambourine from that period in existence.